The Apple rumors keep pilling up. Now they are even talking about an Apple-branded phone which you can flick. It will be iTunes compatible which will be a blessing for everyone. What would you do with a phone that hasn’t got iTunes? Apple registered the mobile-handset-friendly trademark phrase “Mobile Me” in January, covering a range of mobile devices and services. 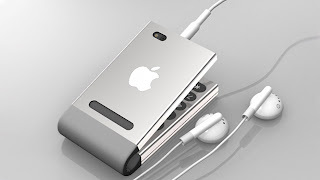 And then there's this concept-image of what’s supposed to be an Apple phone circulating.